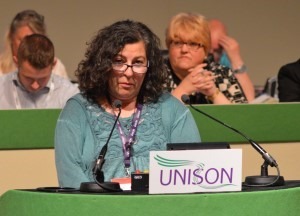 Conference showed just why social work and social care workers need UNISON as it backed a range of measures demanding safe staffing levels. The union will call on all the UK governments to review staff numbers and introduce regulations to force employers to report staff levels and vacancies annually. It also raised concerns about social workers being named in reports which will add to the abuse staff often face due to the negative portrayal of the profession in the media and TV dramas. It was not only a concern for staff but also for people who may need services. “These workers were forced to defend themselves as individuals, not agents of their council”, explained Kate. “If they had not been members of UNISON they would have had to pay for their own legal counsel – though to be fair, their council did pick up the tab. More contempt proceedings against staff followed. Guidance was issued to support workers “but there’s no doubt that it left workers and councils risk averse”, said Kate. Conference applauded as Kate told delegates: “I am delighted to report that in March, on appeal, the Court of Session quashed the contempt ruling against our two members. “But not only that, in their ruling they re-established the principle that the child’s welfare is paramount. 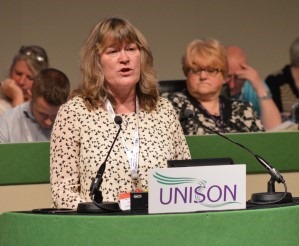 Glasgow branch’s Naomi Junnor underlined the role of austerity in cutting staffing levels and increasing caseloads, constant system changes and the workforce micro-managed. “The number of cases being allocated is reaching dangerous levels which has pushed Glasgow City housing workers to breaking point”, said Naomi. The effect of cuts is that the very principle of these services is under threat. The fight against austerity was the key to protecting staff and services.